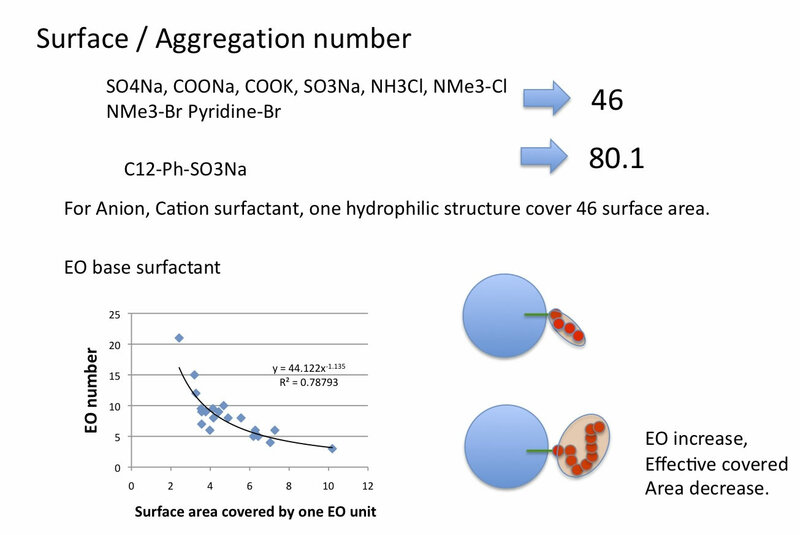 I compiled CMC data for surfactant. I happen to plot logCMC to logP of Carboxylic Acid (Acid form). There is so beautiful correlation! 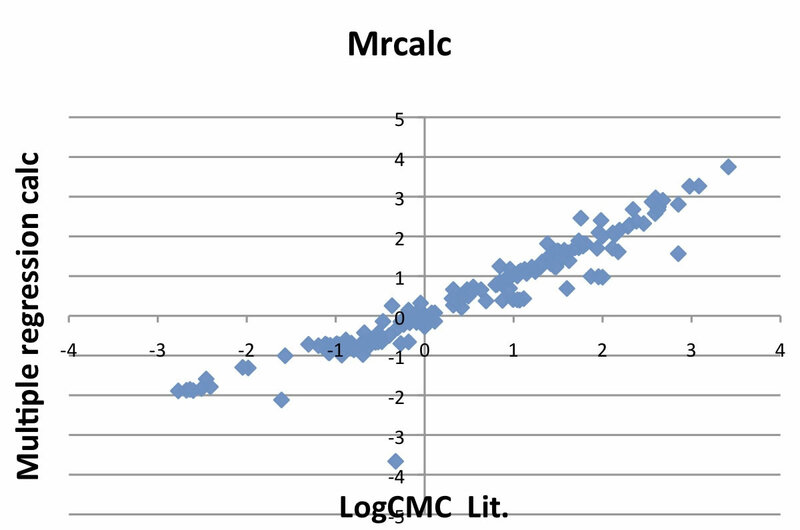 So, I found that Critical Micelle Concentration is governed by logP value. As I wrote in User’s Forum article, logP just means Volume. I compiled more CMC data and check this phenomena. As same with logP, logCMC has very beautiful correlation with HSP Volume. 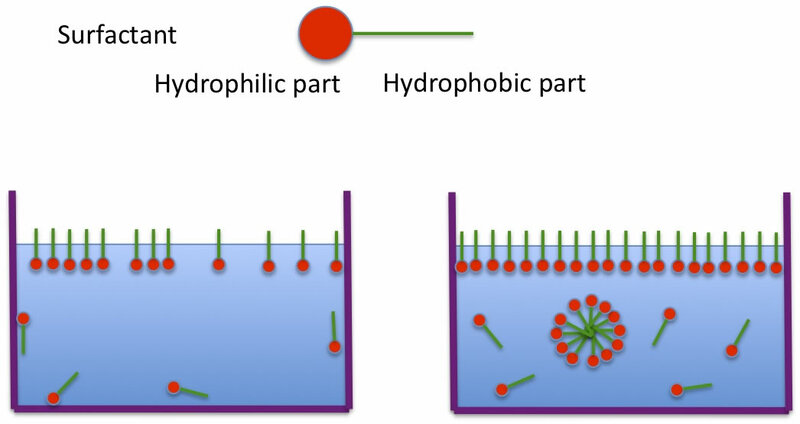 Hydrophobic structure: it means just molecular volume. Fluorinated, aromatic, hydrocarbon, that does not matter. JUST VOLUME! Hydrophilic structure: almost all coefficient is around 2 except Ethylene Oxide. 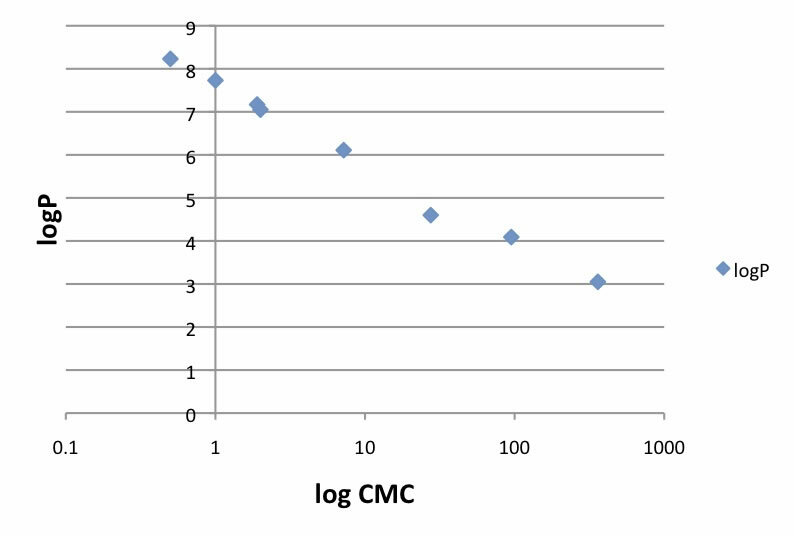 Overall, logCMC is governed by only Hydrophobic structure’s volume. So, logCMC estimation scheme and HLB scheme say same thing. If you plot Fluoro-compounds with HLB (calculated by mass) fluoro-compounds are heavy and HLB become small. But if you plot with molecular volume calculated by HSPiP, it become identical line. If you draw molecule and put X atom at the hydrophpilic part, then calculate, program will calculate CMC. This program do not support -OCH2CH2- type of surfactants. 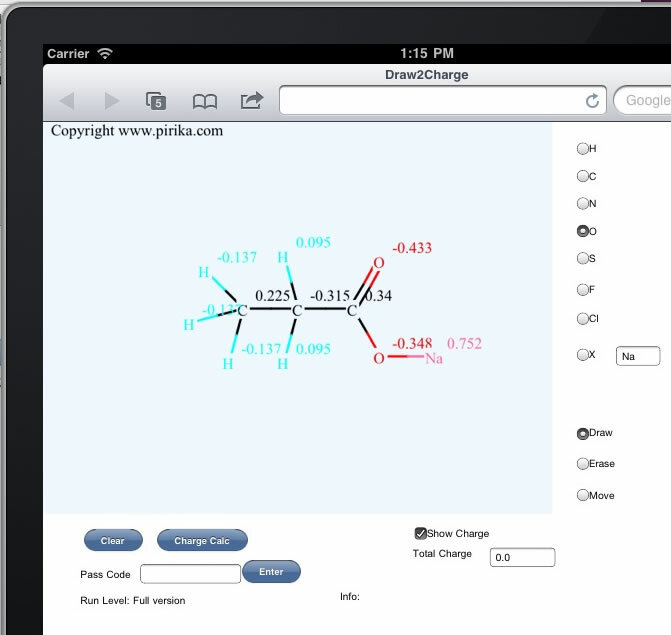 If you want to know how to draw molecules, please refer to Helper applications. 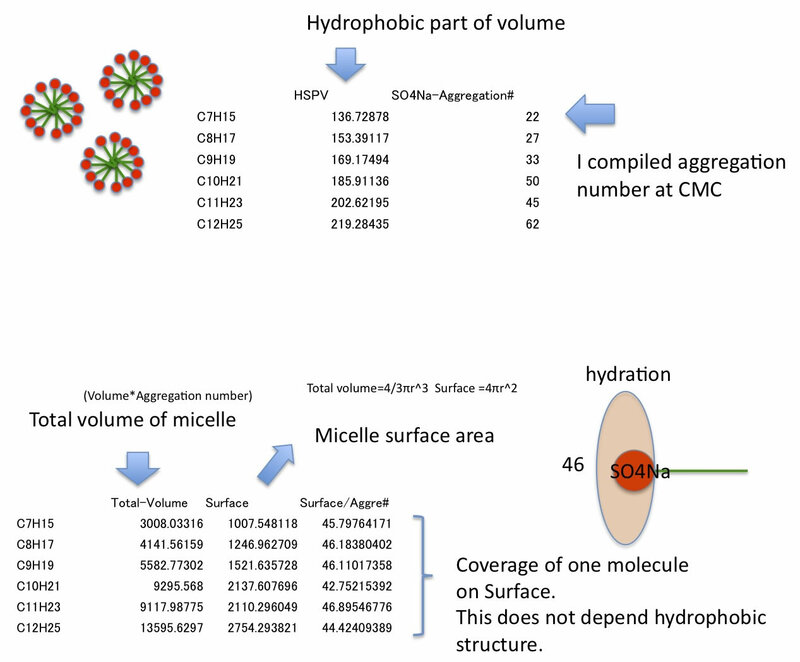 How many molecules aggregate in Micelle? new surfactant fill new surface and surfactant hydrophobic part increase volume. 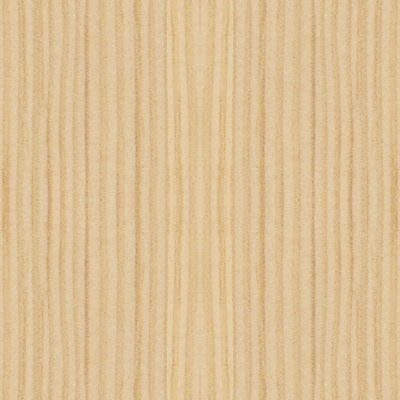 HLB and logP is very similar concept. 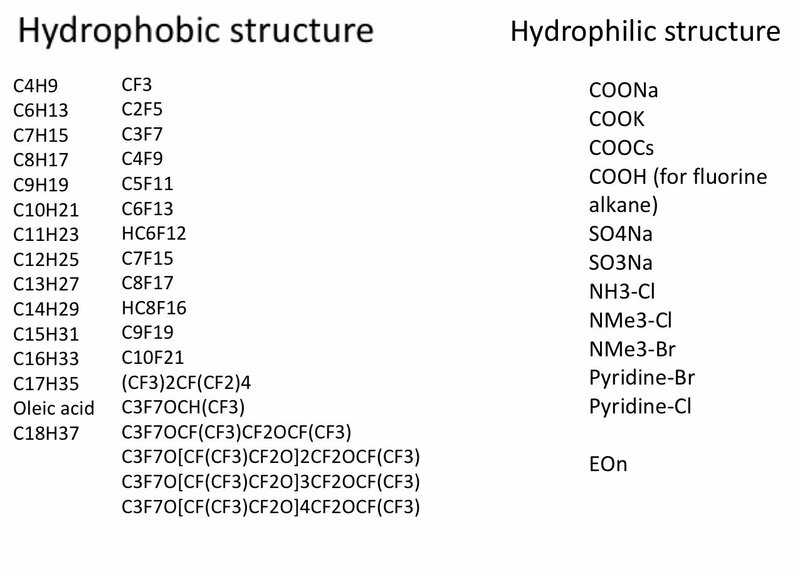 But both logP and HLB is not solubility indicate. 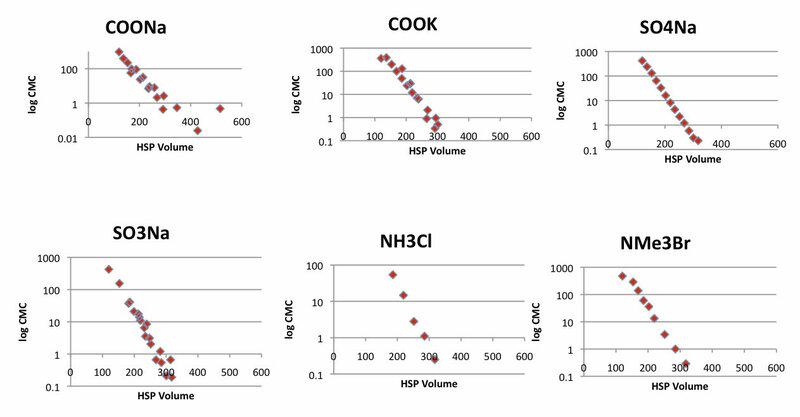 So, there is no correlation with HSP. 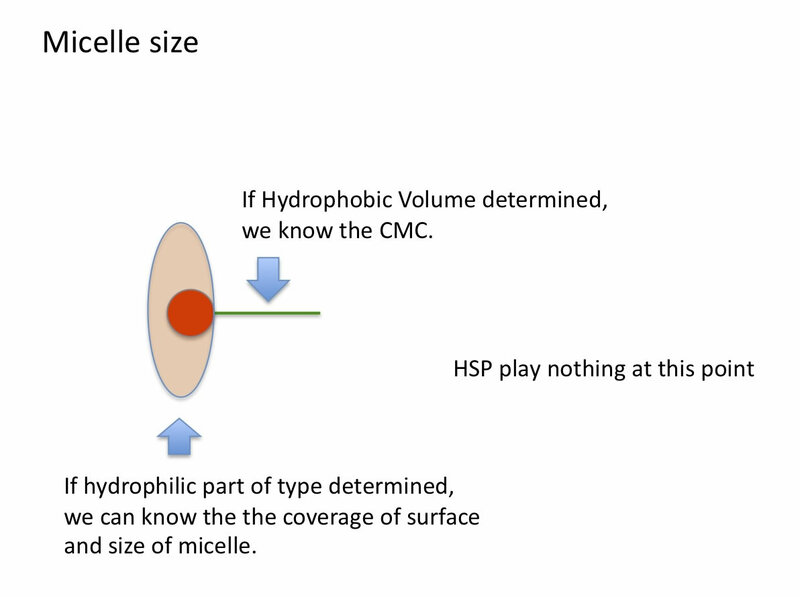 After surfactant make micelle, HSP play very important role. I got the mail about CMC of sulfosuccinates surfactant. If the total hydrophobic volume is same, CMC is ten times larger for Sulfosuccinate. For example, C6H13OOCCH2CH(SO3Na)COOC6H13 volume is 296 and CMC is 12. C17H35So3Na, volume is 301 and CMC is 0.21. C14H29-Ph-SO3Na, volume is 315 and CMC is 0.66. 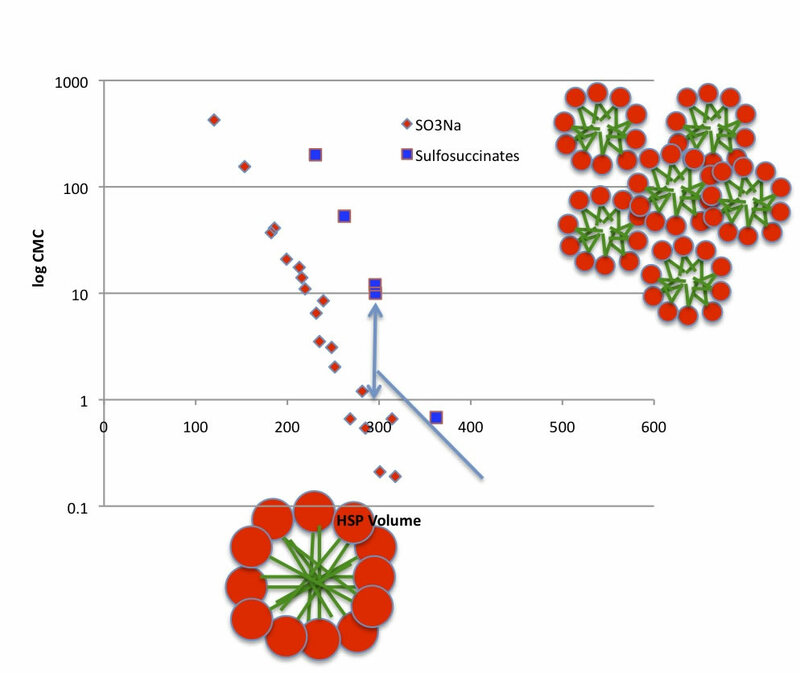 So, with same hydrophobic volume, Sulfosuccinate have 10 time more micelle volume. It will very good for detergent. I search for aggregation number about Sulfosuccinates, but in vain. If you have the data, please let me know. Then I can say which size, how many micelle exist for certain surfactant. Then I want to know how much oil solve to this system. That case HSP will play very important role. Please read article about liquid-liquid extraction .